The Brooklyn Basin project site is approximately 64 acres of waterfront property bounded by Embarcadero Road, Fallon Street, Tenth Avenue and the Estuary. The project includes up to 3,100 residential units including 465 affordable housing units, 200,000 square feet of ground-floor commercial space, a minimum of 3,950 parking spaces, approximately 32 acres of parks and public open space, two renovated marinas (total 170 boat slips), and an existing wetlands restoration area. The Oak to Ninth Project was approved by the City Council on July 18, 2006. The project site is approximately 64 acres of waterfront property bounded by Embarcadero Road, Fallon Street, Tenth Avenue and the Estuary. 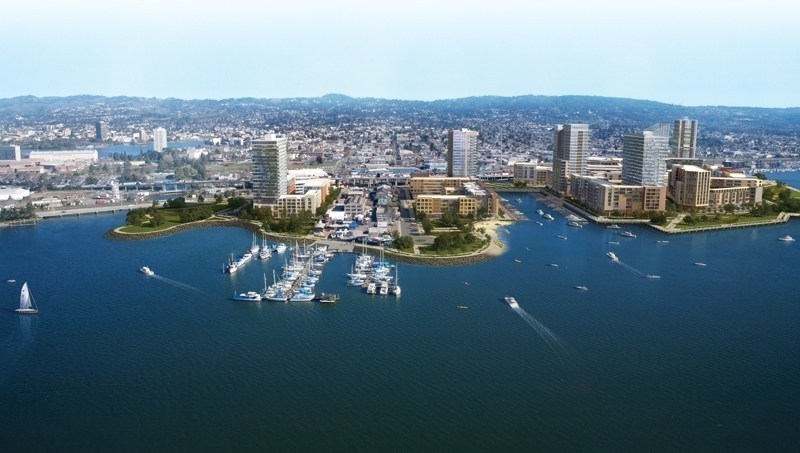 The project includes up to 3,100 residential units including 465 affordable housing units, 200,000 square feet of ground-floor commercial space, a minimum of 3,950 parking spaces, approximately 32 acres of parks and public open space, two renovated marinas (total 170 boat slips), and an existing wetlands restoration area. The existing buildings on the site will be demolished with the exception of the Jack London Aquatic Center, a portion of the Ninth Avenue Terminal shed building, and a portion of the Ninth Avenue Terminal wharf structure. The project does not include approximately six acres of privately-held property along the east of Fifth Avenue that contain a mix of commercial and industrial uses, as well as a small community of work/live facilities. The project will be constructed in four phases over a seventeen year period. An amendment to the Estuary Policy Plan was approved changing the land use designation from Planned Waterfront Development-1 to Planned Waterfront Development-4. The site was rezoned from M-40, Heavy Industrial to PWD-4, Planned Waterfront Zoning District-4 and OS-RSP, Open Space-Regional Serving Park. Amendments were made to the land use maps of the Central City East Redevelopment Plan and the Central District Urban Renewal Plan consistent with the Estuary Policy Plan designation. The project includes the approval of a Vesting Tentative Map. No. 7621, a Preliminary Development Plan, Design Review Guidelines, and a Development Agreement. An Environmental Impact Report was prepared for the project and was certified by the Planning Commission and City Council. Please refer to the bottom of this web page for copies of the consultant reports and final approval documents.